With arguably the coolest job on or off the planet, astronauts need nobody's pity. Nonetheless, theirs is a life of extraordinary psychological demands: leadership, technical proficiency, split-second decision making and ironclad focus. Beyond fulfilling the "hero" requirements, astronauts have to deal with mundane chores, like bringing in new supplies and taking out the garbage. The view is the best thing about their work environment. Air conditioning units put out constant noise. Microgravity is disorienting. Body fluids move all over the place, leaving them with puffy faces. Astronauts often have trouble sleeping and suffer from flu-like symptoms known as the "space crud." Even on Earth, with the ability to go home at the end of the day, we'd find these taxing. These characteristics are still required of astronauts in a lot of ways. Even now, we can't take for granted that another spacecraft launch is going to be problem-free. There still needs to be this sense of courage, of focus. But I think the "right stuff" has broadened. If you're an American astronaut, very often you'll be working with people who don't put as high an emphasis on individualism as the United States does. So, beyond the need for autonomy and independence, there is a greater need for interpersonal and intercultural sensitivity among astronauts. We still do that, but one of the challenges of incorporating psychology and all that psychologists have to offer, is an astronaut's need to maintain an image of constant stability, showing that they are continually ready for flight status. 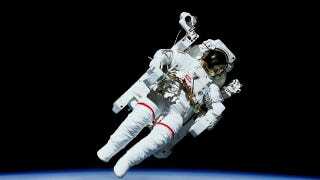 Once an astronaut is selected, they're not likely to say when they are having problems at home, feeling depressed or particularly stressed. Once they're in space, speaking up is even harder. It is still hard for psychologists to offer support to an astronaut in a way that doesn't jeopardize their career. The early Mercury astronauts performed very well. And NASA chose to focus more on depicting astronauts as heroes, as having the "right stuff," with no problems at all, and less on having them speak to psychologists. Vakoch: No. In 1978, for example, a Czech Air Force Pilot named Vladimir Remek joined Russian cosmonauts aboard Mir, the Russian Space Station. He came back complaining of "Red Hand Syndrome." Vakoch: Let's imagine that you're a U.S. astronaut aboard the International Space Station, and a shuttle comes up with a collection of care packages from home. One of your fellow Russian crew members immediately opens all of them up. How do you understand this? What is his motivation? The Culture Assimilator can explain it's the Russian tendency to be exuberant about getting the care packages. It's a culture that takes great pleasure in a grand celebrations. It's the American tendency to want the care packages spaced out over time, to get consistent reminders of people back home. Another part is the prospect of exploring new territories. The next large-scale mission from the United States that was identified by president Obama last year is a trip to an asteroid by 2025. Those astronauts will explore in a way that hasn't been done before - one that could potentially be very important for us. Astronauts love the exploratory spirit of missions. Correction: The original version of this article misstated the Russian space station joined by Vladimir Remek. He joined Russian cosmonauts aboard Salyut 6. Psychology of Space Exploration is available for purchase through the Government Printing Office.